Homogeneous means that the consumers within each segment are relatively similar to each other, in terms of their characteristics. To help determine/prove that the consumers are similar, the free Excel template provides the central means graph, which can visually demonstrate the degree of similarity, as well as the sum of squared error (SSE), which measures the degree of fit to the segment centers. Heterogeneous means that the different segments should be quite distinct and different from each other. In this case, the template provides a segmentation map that shows the relative position of each of the segments on the basis of the first two determinant attributes. 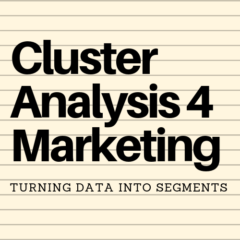 The cluster analysis template provides clear measures of the segment sizes, based upon the respondent data. By combining these percentages with total market size, average product usage levels and average price – then you can develop good measures of each segment – as shown in the article on segment sizes. Substantial means that the potential market segment/s should be large and attractive enough for the particular firm (or brand) in question. As we have clear measurements of each segment (from “measurable” above), we can then consider whether the segment is substantial enough – remembering that generally large firms prefer large segments, while small firms are more likely to prefer niche or small market segments. Is the market segment reachable through structural characteristics (such as distribution channels), as well as communication and media? While cluster analysis may help determine which segments may be more responsive (see below), this is one area of segmentation assessment that probably needs to occur outside of this statistical tool. Is the firm (or brand) able to execute a successful marketing strategy to target the potential market segment? Like the previous criterion, this is an area of assessment outside the scope of cluster analysis, as the decision relies upon as assessment of the firm’s/brand’s resources and capability. The final criterion listed is the segment’s level of responsiveness to a unique marketing approach. Cluster analysis should be able to assist in this regard. Provided that the “input data” used in the analysis uses some behavioral segmentation variables – such as advertising awareness and influence of sales promotion and so on – then the degree of each market segment’s responsiveness can be built into the overall market segmentation structure. Please note that I have also developed the Market Segmentation Study Guide website, where the market segmentation criteria is outlined. Below is an excerpt from that page. If you continue reading it will take you to that site and you will need to hit the back button on your browser to return to this page.